As a fan of comics, I understand why fans want comic-book-movie directors to act like respectful stewards, but as a fan of movies, I want to see these movies directed by megalomaniac geniuses who’d rather fly to Cannes in coach than crowd-source one iota of their vision. Maybe then we’d get superhero movies that honor comics’ tradition of inventiveness, instead of D.O.A. brand-extensions like “Green Lantern,” a glorified video-game cut-scene of a movie in which Ryan Reynolds once again plays a jerk who learns to be less jerky. I’m not suggesting that Marvel give “Thor 2” to somebody like Lars von Trier, much as I’d love to see what that guy would do with Norse mythology and a nine-figure budget. But since the whole reason Hollywood keeps making superhero movies is that they (theoretically) come presold to an audience that buys opening-weekend tickets no matter what, why not turn over these huge canvases to filmmakers who want to splatter them with similarly huge ideas? Pappademas is right to cite fan culture as culprit, but I doubt that liberating the filmmakers from the fans would really do the trick (not to suggest I wouldn't dig Tarantino's Luke Cage, or Cronenberg's Dr. Strange, or Godard's The Watcher). I remember walking out of the theater after screening the Favreau/Downey Iron Man, baffled by how the experience of finally getting a perfect cinematic realization of a comic I always enjoyed left me feeling completely empty, the film unable to imprint any real lasting impact on my brain. I grew up reading comics, and enduring the persistent adolescent disappointment of live action versions that failed through technological insufficiencies that rendered all SFX as juvenile self-parody. The 1970s Spider Man "scaling" walls in the style of Adam West's Laugh-In, Bill Bixby's ennui-drunk bus stop drifter Bruce Banner, J.D. Salinger's son as a low-budget Captain America, Alec Baldwin's post-pulp Shadow, Roger Corman's Fantastic Four, Billy Zane's Ghost Who Walks. All of that accumulated frustration, when finally met by perfect realizations of the comic fantasy as real world, only resulted in a deeper sort of frustration. Part of the cause may be the brain numb from visually processing all of that CGI—the mind sees the wires even if sub-cognitively. But I think the bigger, root reason is that successful cinematic depictions of superheroes obliterate the narrative negative space of the original comic form, and thereby deprive the mind of the imaginative lebensraum that is the real source of wonder. Comic book superheroes are not meant to be real. They are meant to exist in pen-and-ink, occupying panels, sometimes straddling the white void between the panels. The semiotic vernacular of superheroes is an indigenous product of the form, one which works best operating within the form's inherent abstractions and opportunities for the mind to do the work of closure between the page and the things it doesn't show. Considering comic book movies of any sort through the analytical prism articulated so definitively by Scott McCloud in Understanding Comics, this conclusion seems compelled. If that’s too much of a risk, why not give them to craftsmen who understand that not every movie based on a superhero comic needs to operate in a genre called “superhero”? A few years ago, the film-geek Web site Chud.com posted a hoax review of a lost masterpiece from Clint Eastwood and Sam Peckinpah: a stripped-down and brutal take on Batman that abandoned every aspect of the mythos except the vigilantism and the car. Only the fact that this movie never existed keeps it from being my favorite superhero film of all time. Surely an atemporal invention of an imaginary Peckinpah Batman is the right angle of attack for carrying on these narratives in the age of Gothic High Tech? (Not that having Mickey Rourke as a loco Russian with a nuclear bullwhip is a bad thing.) Coming soon: Terrence Malick's 1973 High Evolutionary, John Woo's 1983 Cantonese Nick Fury and J.D. Salinger's Bucky Barnes, AWOL in 'Nam with Alice Cooper and the Beav. I am a big fan of Dave Stevens' The Rocketeer. I have been for a long time. Take a look at that drawing at right. That's the official logo and t-shirt design I worked up for Aggiecon 23 way back in 1992. 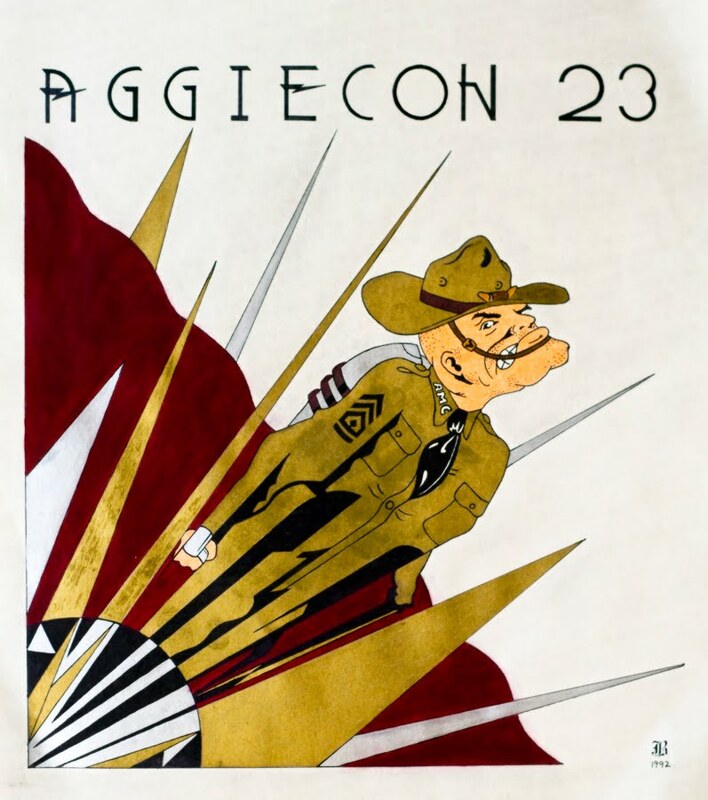 That's Texas A&M University's historic Ol' Sarge mascot incorporated into the design, which got a lot of chuckles because of the incongruity. The convention was wary about spending so much to have a multi-colored shirt printed up, but in the end every last shirt sold out, and to this day I'm measurably proud of my brief and otherwise unremarkable career as an artist. I'm a sucker for the swash-buckling, cliffhanger adventures of the 1930s pulp adventure heroes. I deeply love the movies Raiders of the Lost Ark and Sky Captain and the World of Tomorrow, and enjoyed the short-lived TV series Tales of the Gold Monkey so much that I wrote up a springboard to relaunch it as an ongoing comic book series in the early years of our new century. Lest you think that was a product of wishful thinking and ill-advised fan fiction, I actually got as far as discussing licensing with Universal before the comic publisher got cold feet and backed out (for the record, Universal wasn't even sure if they still owned the rights. Most of the people I spoke with hadn't even heard of the series. Can I pick a hot property, or what?). But The Rocketeer? Wowness! For those of you unfamiliar with The Rocketeer, let me explain. No, there is no time. Let me sum up: Cliff Secord, a Gee Bee racing pilot in 1938 discovers a stolen rocket pack designed by Doc Freakin' Savage that allows a man to fly through the air with the greatest of ease. With the aid of his airplane mechanic buddy Peavy, he debuts an air show stunt act as the Rocketeer to make enough money to keep his bombshell "art model" girlfriend Betty happy, but soon runs afoul of mobsters and Nazi agents who want to steal the rocket pack. Oh, the Feds and Doc Savage (along with Savage's assistant Monk and Ham) want the rocket pack, too. Cliff, headstrong and passionate, doesn't always make the wisest of choices. Mayhem ensues. And that's just the first story arc. The second, "Cliff's New York Adventure," follows up immediately on the first with Cliff chasing his now-estranged girlfriend to New York City, where he runs into that other great pulp character, the Shadow, who enlists Cliff's help in thwarting a serial killer. That's just aces in my book. Stevens was careful never to name or overtly identify any of these trademarked characters, but the homage is clear enough to anyone with even a passing familiarity with the genre. In 1991 a well-regarded movie version was put out by Disney, which combined elements of both storylines to craft a more cohesive plot. The "Betty" character was changed to "Jenny" and her overt sexuality toned down, while Cliff was somewhat less of a lunkhead in the film, but other than that, the spirit of the film is remarkably faithful to the comic, evidence of Stevens' close involvement with the project (one thing that surprised me is that there is not Neville Sinclair/Errol Flynn analogue in the comics. I'd heard the Errol Flynn connection for years, obviously from people who'd never actually read Stevens' original). I can't recall when I actually became aware of the existence of Dave Stevens' Rocketeer. I was aware of the character in comic form before the movie adaptation came out in 1991. I almost certainly did not know about it prior to the fall of 1988, when I arrived at college and discovered my first dedicated comic book retailer. Up until then, I'd lived in a very small town and hadn't seen comics with any regularity until the local grocery store started carrying Marvel and DC on the magazine racks in 1987 (I know the date well, because I still have Silver Surfer no. 1 in my long boxes--oh, that Ben Grimm!). Somewhere along the line, I came across The Rocketeer and got all giddy. I can't recall if it was in the back pages of Starslayer or a later incarnation. I just remember the designs and artwork were killer, and I'd never seen anything like it. I also never owned anything like it either. For some reason or other, I never managed to acquire a single issue of The Rocketeer in comic form, with the exception of the Peter David/Russ Heath movie adaptation, which doesn't really count. Area comic shops didn't have it in their back issue bins. When Wizard World came to Texas in November of 2003, I made the long trip up to Dallas (along with Mark Finn) with the intent to buy every single comic book that ever featured Dave Stevens' inspired creation. I went home empty-handed. There were plenty of Cerebus collections, but no Rocketeer anything. I turned to Ebay and discovered the joys of being sniped constantly or watching back issues go for outrageous sums. For a comic I was ostensibly a big fan of, I was having a hell of a time getting my hands on any. At some point, I gave up and forgot about it. Enter IDW Publishing. 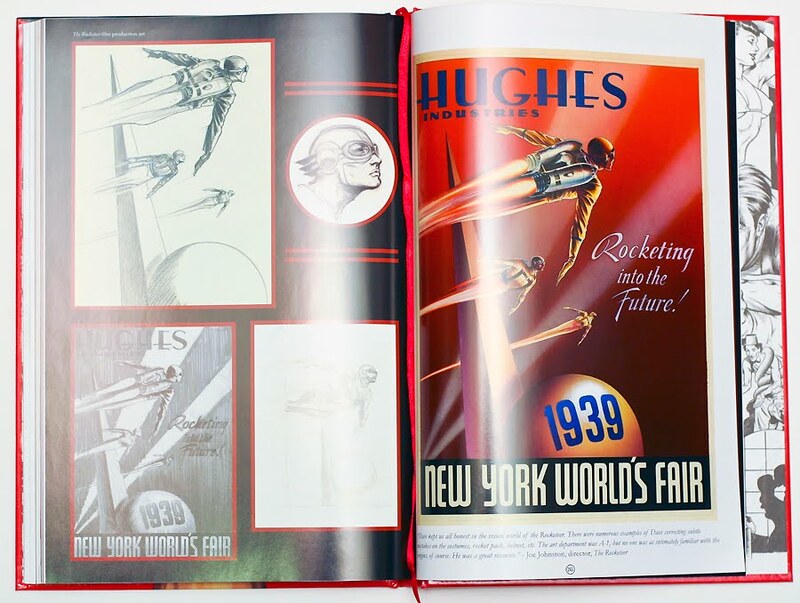 Before Stevens' untimely death in 2008, the wheels were set in motion for a collected omnibus publication of all of Stevens' Rocketeer stories from the previous two decades. 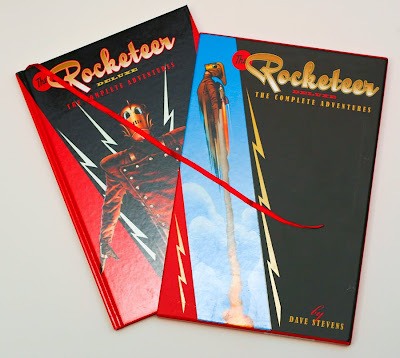 The Rocketeer: The Complete Deluxe Adventures is a magnificent book. I can't stress that enough. It's also quite costly at $75 retail (a non-deluxe edition, The Rocketeer: The Complete Adventures, can be had for around $20). 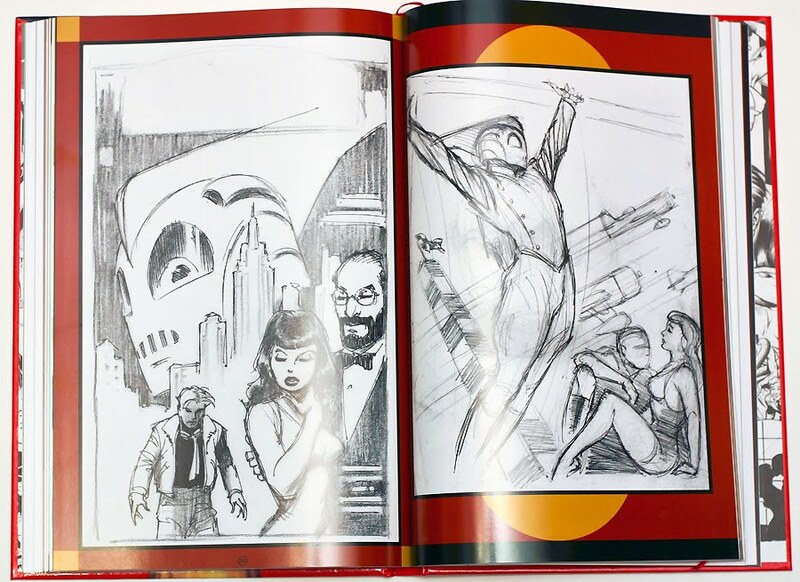 I also feel obligated to point out there's the Dave Stevens' The Rocketeer Artist's Edition available for the bargain price of $250 (although it was initially offered by IDW for $100), which reproduces Stevens' page layouts with pencil marks, liquid paper and all the artistic detritus that comes with producing a comic. I'm not that hard-core. But what does the deluxe edition bring to the table that the other doesn't? Lots. 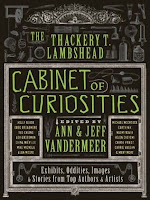 First of all, it's got a gorgeous, full-color slipcase, as seen two images up, and is oversized with lush, lush, lush artwork. Both of Stevens' completed Rocketeer adventures: The Rocketeer and The Rocketeer: Cliff's New York Adventure simply pop off the page with all-new coloring by Laura Martin. Every single page could be framed as a work of art. I'm telling you, it's that good. 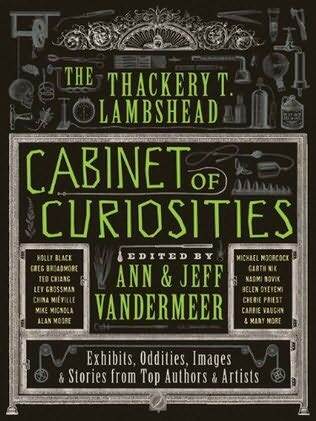 This book is a trove for Stevens fans. As you can see above, there are a generous number of page breakdowns along with Stevens' original, hand-written scripts on yellow legal pad. You don't get more authentic than this. 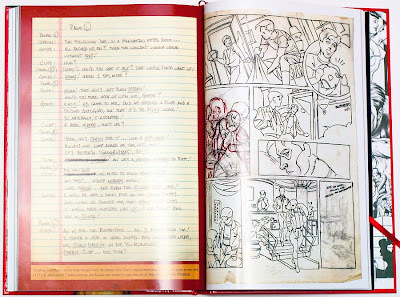 While entire scripts aren't reprinted, and his breakdowns only give a hint to his fluid creative process, they're valuable reference material for aspiring comic writers as well as artists on how one particularly gifted creator made his magic. There's also a nice section on the legendary Bettie Page, the 50s pin-up icon who was the direct inspiration for Cliff Secord's girlfriend "Betty" in the comic. 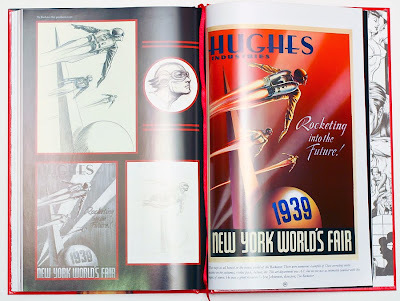 I don't know if any Rocketeer fans are unaware of the story by this point, but The Rocketeer helped revived mainstream interest in Page, eventually prompting Stevens to track her down and discover the former model (living in modest conditions) was not receiving any compensation from all the businesses profiting from her likeness. Stevens took on the role of her financial guardian of sorts, and Page was able to live out her life in relative comfort. It's a nice story, and reaffirms that people can do nice things for each other because it's the right thing to do. I also learned that B-movie "Scream Queen" Brinke Stevens (who also happens to be Dave Stevens' ex-wife) modeled for the iconic Betty photo session splash in the initial storyline's run. Learn something new every day. 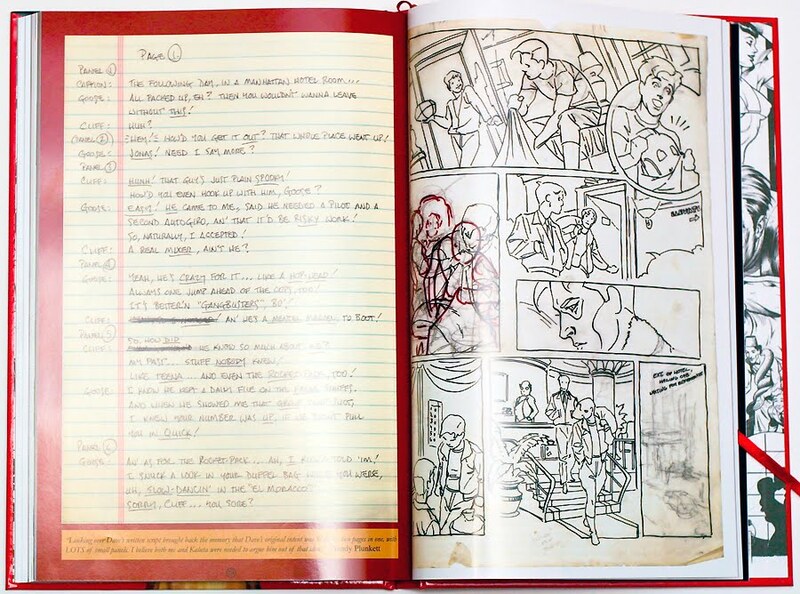 There's a host of pencil sketches, designs and memorabilia ideas packed into the book that makes me want to cry, they're so beautiful. There's one sketch for an unproduced metal sign Stevens worked up that I'd love to have hanging in my office. But the most distressing thing about the collection is how damn few Rocketeer stories ever got published. It seems like there should be a lot more, since Stevens first published his masterwork in 1982 and a pretty good movie adaptation came out in 1991. But Stevens only completed two storylines that together barely fill the number of pages we've come to expect for a "graphic novel." And even so, "Cliff's New York Adventure" is open ended, with Cliff and Betty's relationship issues unresolved and Cliff still on the East Coast with the ownership issues of the rocket pack unresolved. Stevens' gleeful obsession with pulp-era characters--populating his two Rocketeer stories with unnamed versions of Doc Savage and the Shadow--is a clear precursor to Alan Moore's League of Extraordinary Gentlemen--so it's no surprise that his next proposed storyline picks up directly after "New York Adventure" ends, finding Cliff in New Jersey and involved with another character that first appeared in 1938, Superman. And not just any Superman, but the Superman of 1938, as Siegel and Schuster created him, literally "faster than a speeding bullet, more powerful than a locomotive, and able to leap tall buildings in a single bound." As if that's not enough to get any comic geek's heart pumping, Stevens sets the epic team-up on Halloween, 1938. Yeah, Orson Wells' Mercury Theatre broadcast of "War of the Worlds." Except that the alien invasion is real, and the Rocketeer and Superman have to team up to save the Earth. And defeat a giant robot as well. Naturally, DC Comics turned the story down and it remains unpublished to this day. Philistines! But there is always hope. IDW Publishing has brought back the character with The Rocketeer Adventures, a mini-series anthology backed by an all-star lineup of talent. The collected volume is due out in November, and I can't wait to see what extra goodies are packed in there. Hopefully, this new mini-series will beget another, and perhaps even an ongoing. 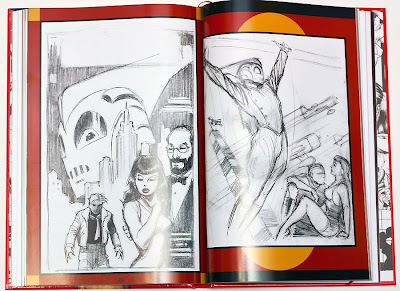 In a perfect world, we will never have to go so long between Rocketeer stories ever again, even if Dave Stevens is no longer around to share them with us. Behold, No Fear of the Future boldly jumps into the Facebook fray, a mere half decade after this social networking site came to dominate the interwebs. Tremble at our foresight and cutting-edge initiative! "Like" us if you dare! Coming soon: Our very own MySpace page! Despite an unfortunately emphatic return to Earth in which the parachute failed to deploy and the sample return capsule pancaked onto the Utah desert, the NASA Genesis Discovery Mission succeeded. Witness the June 24 issue of Science. The magazine's cover is a photo of the particle concentrator extricated from the spacecraft-pancake. Two articles announce important findings from analysis of the concentrator, changing our understanding of the composition of the primordial solar system. And these are just two high-profile examples of the journal and conference papers occasioned by Genesis samples being sent to researchers around the world who have asked for them. Not bad for a mission with a spectacular equipment failure at the end! What saved the science was contingency planning. The nominal mission would have had the sample return capsule, dangling under a parachute, delicately snagged in mid-air by a helicopter. But design decisions were driven by considerations of how to salvage the samples even if the return capsule broke. Five silicon collector arrays that had basked in different regimes of the solar wind were each of a different thickness. Every fragment bigger than a breadcrumb revealed what array it came from. The particle concentrator and its matrix were more robust than they might have needed to be. So the concentrator, which was identified in the early proposal stage as being of potentially high scientific value, ended up mainly intact - high value science and all.